I will always find it interesting when people fail to recognize (or flat out dismiss) a political statement, even despite the subtlety of the situation and the argument of "how far we've come since this was a real political statement." If Loving and the outrage over a recent Cheerios commercial featuring a biracial young girl and her interracial parents taught audiences anything, it is how far we've come yet how far we still have to go. That said, THE BIG SICK is one of those films that is a political statement despite it being presented as one. Or so its co-writer and star Kumail Nanjiani has admitted. He recently told Variety Magazine, “It is interesting that the movie is being seen in a different context than it was intended. Obviously it would be great if our movie came out and people didn’t see it as a political statement because it really isn’t. It is just a love story and a comedy.” Here's the thing: THE BIG SICK is an interracial comedy starring a Pakistani-American male (Nanjiani) and a white American woman (Zoe Kazan) as the romantic leads, hitting theaters at a time when the United States president has tried to ban Pakistanis from entering the country, accusing them of being a terrorism threat. So yeah, it may not be his intent to make a statement (after all, the film is inspired by the true love story between Kumail and his real life wife--and co-writer--Emily V. Gordon), but it is one anyway. In sharing their own romantic tale, Gordon and Nanjiani help normalize the idea of a love that can exist across cultures. But even more profoundly, it doesn't ignore the obvious differences between them -- from his family's tradition of arranged marriages to the fact that she's a free spirited divorcee. In other words, it doesn't neutralize their cultural nuances to try to appeal to mass audiences. 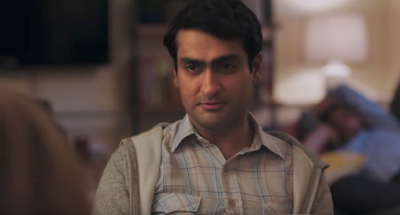 In fact, similar to Aziz Ansari's wonderful Master of None series on Netflix, we see Kumail's (Nanjiani) family contextualized in the film and having a significant influence in his life as he straddles his cultural traditions and his very different American upbringing to which he's become assimilated. But this isn't to take away from the fact that THE BIG SICK is thoroughly entertaining, and not to mention charming. Nanjiani is hilarious as Kumail, the deadpan uber driver/comedian whose chance encounter with the perky Emily (Kazan) would alter the way he looks at love. If Hollywood needs more proof that non-white male actors can be excellent romantic leading men, Nanjiani's performance here should be more than enough evidence of that. He's hilarious, while portraying the right amount of gravitas when the scene calls for it. As its title indicates, the film spends much of the time in a hospital when Emily suddenly falls gravely ill, bringing together Kumail and Emily's parents (played by the exceptional Holly Hunter and Ray Romano, who rush in from out of time to be by their daughter's side) to form an unlikely relationship. So Kumail shares the bulk of his scenes with Emily's parents, especially Terry (Romano), breaking romantic comedy tropes that show romance strictly between the man and woman. Here, the male love interest is circumstantially wooing her parents (which is actually not a bad way to court a woman). It has the same meet, conflict, and resolve format that most romantic comedies follow, but it has an actual purpose, intentionally or not. Meanwhile, there's Kazan, who never really goes outside her natural range of cute and affable, though it works perfectly for this role. It lends itself to the tenderness of this movie, which is a much needed refresh for the romcom genre and, yes, the political statement we deserve right now. THE BIG SICK opens in select theaters June 23, followed by a national release on July 14. Just to clarify: Pakistan was not included in the travel ban.